As your Merced dentist and staff, we not only want you to have a great smile, we want to help you maintain it. In addition to your bi-yearly dental exams, you can promote oral health by eating foods which help you keep your gums and teeth healthy all year long. By working the foods listed below into your daily diet as a snack or meal, your gums will remain pink and healthy, and you’ll reduce your risk of cavities. Fruits give us vitamin C which our body processes to reduce inflammation. Citrus fruits especially are known for their high vitamin C content and are great for boosting your immune system as well. Additionally, these foods maintain pink, healthy gums. Start your morning off with an orange or grapefruit or add fresh lemon to your evening meal. Vegetables like carrots, sweet potatoes, squashes, and dark leafy greens are a great source of vitamin A. This vitamin strengthens the enamel on your teeth and protects teeth from cavities. These vegetables are best eaten with a healthy fat to maximize vitamin absorption. Our Merced dentist suggests roasting these treats with a bit of olive oi and a light sprinkle of salt and pepper to give your vegetables flavor while optimizing your vitamin intake. The calcium found in cheese builds strong bones and teeth. Additionally, cheese promotes the production of saliva which is used to aid in digestion. Saliva cleans the mouth of food particles which may otherwise hide between teeth and turn into cavity creating bacteria. Build strong teeth and healthy gums with an easy snack that tastes great and is good for you, too. A handful of almonds are fantastic for healthy gums. 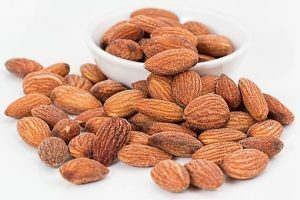 Almonds are a great source of calcium and one of the best sources of vitamin E. Almonds have anti-oxidant properties as well that aid in fighting the bacteria in your mouth. This snack is a healthy choice of protein and fiber and helps reduce blood pressure. Healthy food choices keep you feeling full longer and promote a healthy mouth. Snack on almonds and cheese instead of chips and cookies. Roasted vegetables and fruit can replace your midday treat. Add a dollop of yogurt to fruit for extra sweetness or consume raw. You can’t go wrong when you include any of these foods in your day. After you’ve had your meal or snack, remember to brush and floss. With a healthy diet and regular dental exams with our Merced dentist or hygienist, you’ll maintain your beautiful smile. For more ways to keep your smile looking its best, follow us on Facebook.